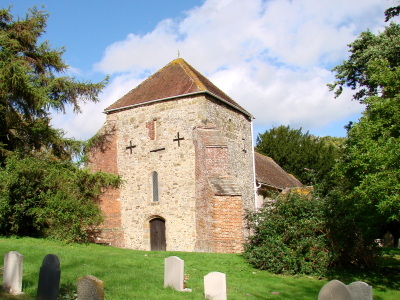 The unusual C13 plan has a tower, aisleless nave and chancel, all of equal width. 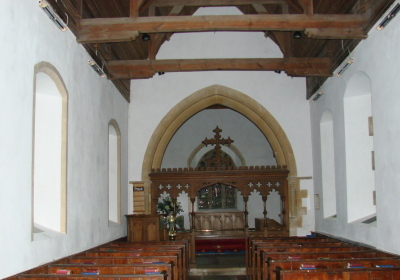 The chancel and north side of the nave were rebuilt in the C19. There is a fine C14 tomb-recess. 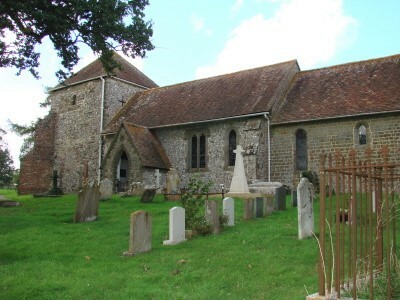 Bepton church lies under the Downs near a farm, with extensive views from the churchyard. It is best seen from a distance, for it has been heavily renewed. Of the church in Domesday Book (11, 15), nothing remains, for it was rebuilt in the C13. The west tower, aisleless nave and chancel are, unusually, all the same width, though because of C19 reconstruction, only the tower and the south side of the nave are now of this date. 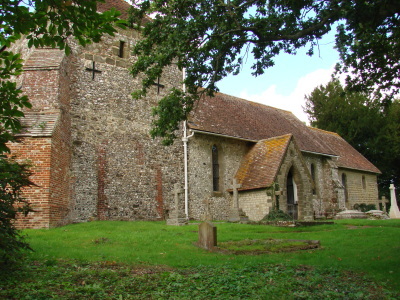 The squat tower of flint and rubble has a large tiled pyramid starting a little above the nave roof. The rere-arches of its north and west lancets seem too tall for the lancets. The tower arch is definitely early C13, for though pointed, the chamfer on the head is slight, with plain, square responds and abaci. The walls of the lower stage are 3ft 6 in thick (1 p3), but only 2ft in the second stage, which has simple rectangular openings. There may have been a change of plan, for the proportions suggest a further stage was intended. As built, there seem to have been no buttresses and the present irregular brick diagonal ones date from 1620 (ibid p4). They are massive for such a low structure and suggest structural problems. If these started during construction, the curtailed height and lighter upper stage may have been an attempt to avert them. Two renewed south lancets resemble those on the Sharpe Collection drawing (1805) and have segmental rere-arches rather than scoinsons, a feature found also at Didling, the next parish, though the other architectural evidence there suggests a date rather later in the C13 than here. The round-headed south doorway (now in a C19 porch) is early C13, not earlier. Later changes were confined to detail. Adelaide Tracy (1849) (I p47) shows an east window of three trefoil-headed lights as today, which was probably C14. The simply moulded four-centred tower doorway is late C15, a little later than the two-light renewed square-headed south window by the porch. The Sharpe drawing shows it follows old lines. The work of 1620 on the tower probably also included the quite extensive brick patching on the actual structure. L W Ridge did not touch this when he largely rebuilt the church in 1878 (WSRO Par 17/4/1). Three north lancets replaced the single one shown by Quartermain (W) p43) and the south porch and the chancel, including the arch, are by him. Little is known of the previous arch, described tantalisingly as ‘interesting’ (SAC 43 p224). From Adelaide Tracy’s drawing it is clear that Ridge copied much of what he found, probably including the abnormally deep internal sills of the easternmost lancets on both sides. Some walling, though faced in heavy sandstone, may also have been retained. She also shows clearly the oddly truncated south east lancet, though according to Ridge’s plan it was rebuilt. 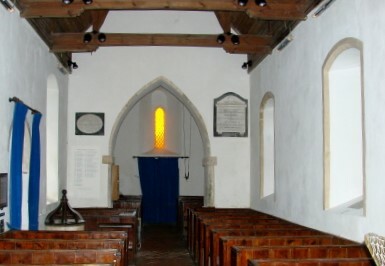 A round-headed north doorway in the chancel like the south one now opens into the vestry; it could be the original one nave doorway reset, though it looks very renewed. Ridge replaced all the roofs. Font: Plain and tub-shaped, it looks C19 and the VCH describes it as such (4 p42), but A K Walker (p44) suggests it is old work re-cut and it has been called ‘Norman’ (Mosse (ed) p7); www.crsbi.ac.uk also believes it is old. If so, it is early C12 at the latest. 1. (Two two-light north and south nave windows) J Powell and Sons; that to the north of 1903 with the Empty Tomb was designed by H Holiday and E Penwarden. Single lights dated 1903 and 1914 are also by Penwarden and one of 1919 is by J H Hogan (all Hadley list). 2. (Nave north west window) T Baillie and Co, 1869. This shows a central mandorla set in patterned glass and predates the restoration, assuming the date is correct. 1. (North chancel) Fine tomb-recess of c1300 in the position of an Easter sepulchre. The carving is vigorous rather than delicate, but it is proudly up-to-date with a cinquefoiled arch, triangular label with a pierced trefoil, heavy crockets and finial. There is a damaged inscription in Lombardic letters to Rado de la Hedol. 2. (By the vestry doorway) C13 carved tomb-slab. 3. (In churchyard) Ian Nairn (BE p101) admired some C19 iron tomb-markers; by 1978 only one broken one (vidi) remained and now there is none. However, one of the same type survives in the churchyard of the new church at Treyford. 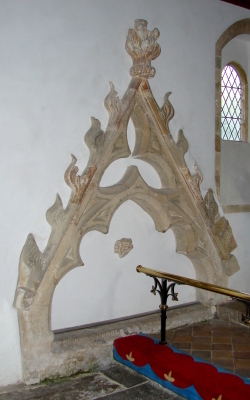 Paintings: There are said to have been traces of decorative painting over the previous chancel arch (SAC 43 ibid). Nothing further is known. Piscina: (In chancel and presumably reset) C13 trefoil-headed.